Yoga timers allow you to keep track of how long you practice yoga. These can be particularly helpful tools for meditative forms of yoga where watching a clock just isn't an option. You can also keep track of how long you do specific movements when doing more active forms of yoga. No matter what type of yoga you're doing, there's a yoga timer out there that meets both your needs and your budget. There are two types of yoga to consider when looking for a yoga timer. More active forms of yoga where you perform actual poses allow you to look at the timer during a session. More passive forms of yoga require you to concentrate on things other than clocks. Thus, there are different features to consider when looking for a yoga timer. If you do both kinds of yoga, you may find it easier to get a yoga timer that can help you with both styles. Active Yoga Timers: Active yoga timers allow you to keep track of how long you perform a technique or movement. 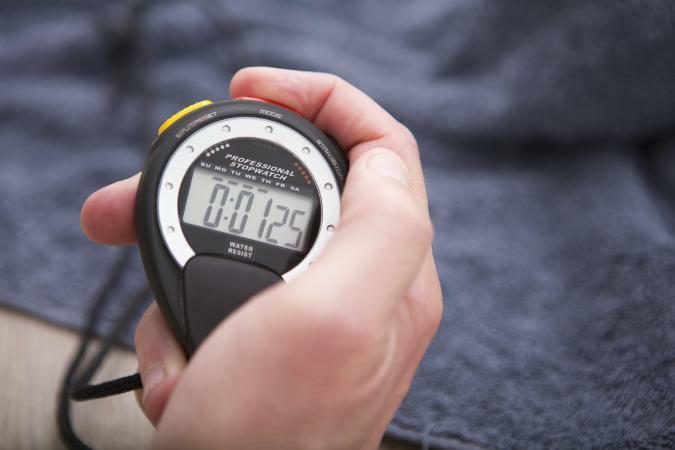 These yoga timers are little more than a stopwatch that you use for yoga. You can also purchase a model that you set for a specific amount of time, like an alarm clock. Once the time has run down, the clock resets itself, striking only once. If you have a number of movements to perform for the same length of time, this is the type of yoga timer you will want. Passive Yoga Timers: Passive yoga timers work a bit like an alarm clock. However, the notification sound is more discreet. For example, the sound may be a gentle bell sound. Other units allow you to select from a number of different tones. Sage Meditation: Here you'll find a portable timer that vibrates for around $35 and stationary pyramid-style timer that gongs and sells for just under $80. Amazon: This website offers the Miracle Cube Timer which comes with preset alarms for 5, 15, 30, and 60 minute intervals. To reset the timer, simply turn the cube until the desired time faces up. The price on this timer runs between $15 and $20 depending on the exact one chosen. Yoga timers are surprisingly affordable. As of January 2001, basic yoga timers can be had for under $20. Some websites sell kits with mats, DVDs and a timer for under $30. On the high end, you can pay $100 for a timer. However, there aren't really any functions you are paying for at $100 that you aren't going to get at $20. Think of how much you would spend on a quality stopwatch or alarm clock and factor that into your comparison shopping. Remember that you can do yoga without a timer if you so choose. It's not always necessary to purchase a bunch of gear in order to practice effectively. But, people who need to fit a yoga routine into a busy schedule may find that a timer helps to maintain consistency. Yoga instructors may also appreciate the aid of a timer instead of other types of clocks.